PCI-SIG, the standards committee behind PCI Express and related standards, has issued a warning about incompatibilities between their M.2 standard and Samsung's NGSFF/NF1 SSD form factor. The notice from PCI-SIG does not refer to Samsung by name, but does indirectly call them out for basing a new form factor on a mechanically identical M.2 connector without introducing a new keying option to prevent improper insertion of M.2 drives into NGSFF slots or vice versa. Samsung's NGSFF form factor was unveiled in 2017 as a proposed replacement for M.2 and U.2 SSDs in datacenter applications. The goals are similar to the competing EDSFF standards derived from Intel's Ruler: provide more power than can be delivered over M.2's 3.3V supply, allow hot-swapping of cards, and widen the cards beyond the typical 22mm to allow for two rows of NAND flash packages side by side. Samsung's standard re-uses almost all of the data and ground pin assignments from M.2, but removes the 3.V supply and adds 12V power elsewhere. Samsung was initially hoping to call their standard M.3, but from what we've heard from unofficial sources this was going to make PCI-SIG very unhappy, so Samsung made a last-minute name change to NGSFF before going public. Not all of their partners got the message, and even Samsung's own exhibits did not quite have all traces of "M.3" thoroughly erased. Since then, Samsung has pursued standardization through JEDEC with a new name of NF1 for the form factor, but that effort seems to have stalled earlier this year without achieving ratification. However, even without standardization, Samsung has been moving forward with deployment of NGSFF SSDs and they have picked up several major partners along the way, including OEMs like Supermicro and AIC. PCI-SIG's complaints about NGSFF are all about conflicting pin assignments for the M.2 M-keyed connector. 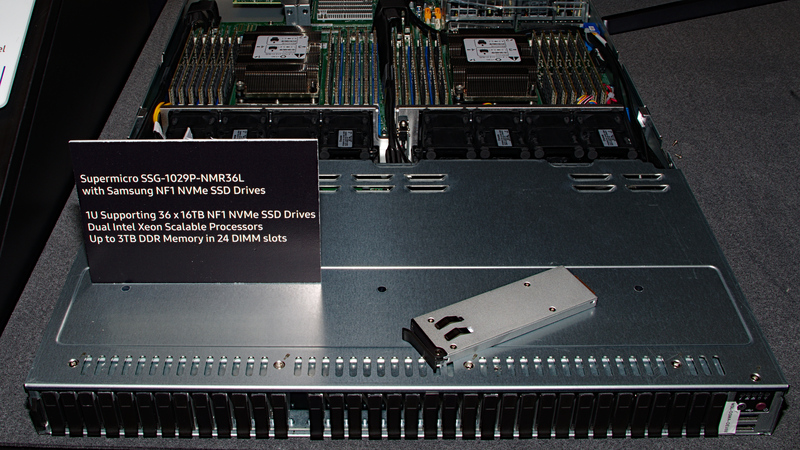 In order to add 12V power and PCIe dual-port capability, Samsung had to make use of many previously-unassigned pins that existing M.2 drives and sockets leave disconnected. Several of Samsung's new pin assignments conflict with new assignments for the forthcoming M.2 revision 1.2 specification, which will add an optional set of USB 2.0 data lines and the option of a 1.8V power supply and lower-voltage signaling on some control lines. The warning from PCI-SIG neglects to mention that some of these conflicts are still largely hypothetical and is written as if the 1.2 revision of the M.2 spec were already finalized, though it is expected to be complete by the end of this year. Some of the pin assignment conflicts pose a risk even with currently extant products. For example, NGSFF SSDs have a ground connection on pin 20, adjacent to pin 18 where M.2 sockets provide 3.3V power, so an NGSFF SSD inserted into a standard M.2 socket is just one bent pin away from a short circuit. (There's a more serious conflict in the other direction with the upcoming M.2 standard, which adds a ground connection on one of the same pins that Samsung is using for 12V.) 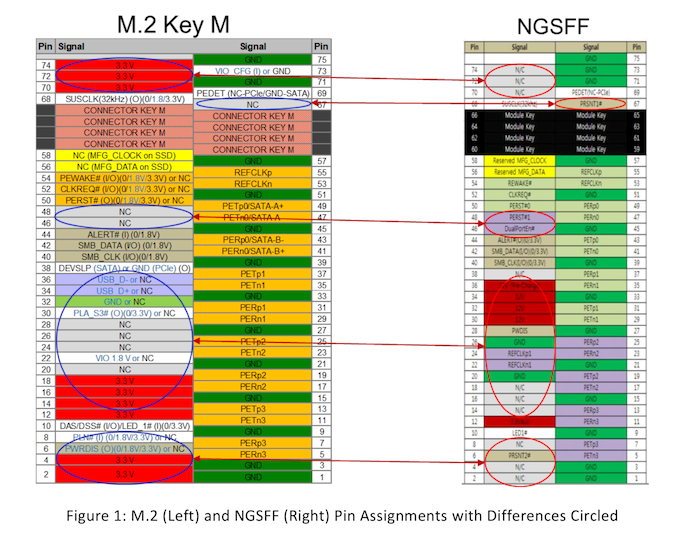 There are also five pins that NGSFF uses which are still unassigned even in revision 1.2 of the M.2 spec, and thus leave the door open for more future conflicts. 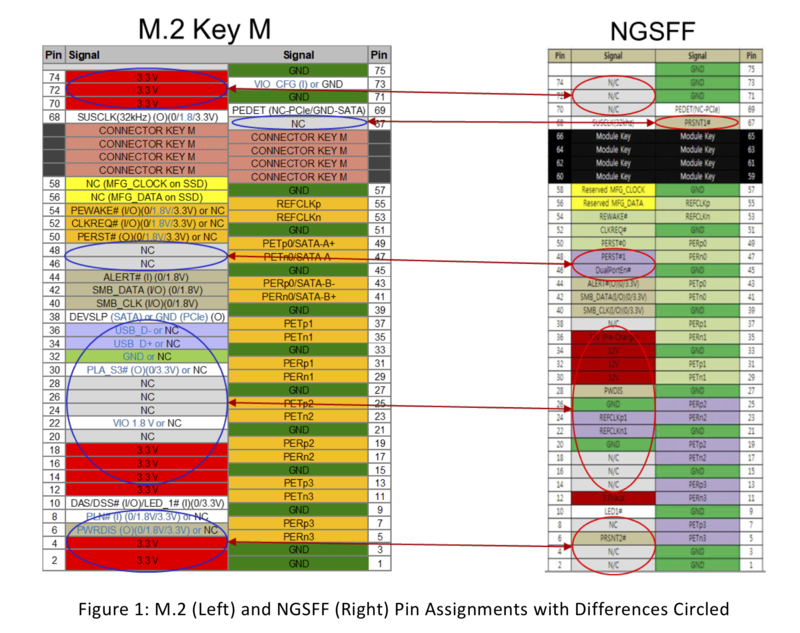 The incompatibilities between M.2 and NGSFF may develop into a serious problem, but as things currently stand the warnings from PCI-SIG are a bit overblown. Some degree of electrical compatibility between NGSFF and the current M.2 revision 1.1 is possible, proving that there is some utility to Samsung's re-use of the same mechanical connector with a similar pin-out. Minerva, Taiwanese makers of almost every kind of storage adapter possible, has several adapters that provide slots capable of accepting M.2 and "M.3" NGSFF SSDs. These adapters are safe to use with M.2 SSDs that adhere to the current spec and do not connect the unassigned pins that Samsung uses to deliver 12V power, but could cause problems with upcoming M.2 revision 1.2 cards (and are subject to the adjacent 3.3V and ground pin risk mentioned above). 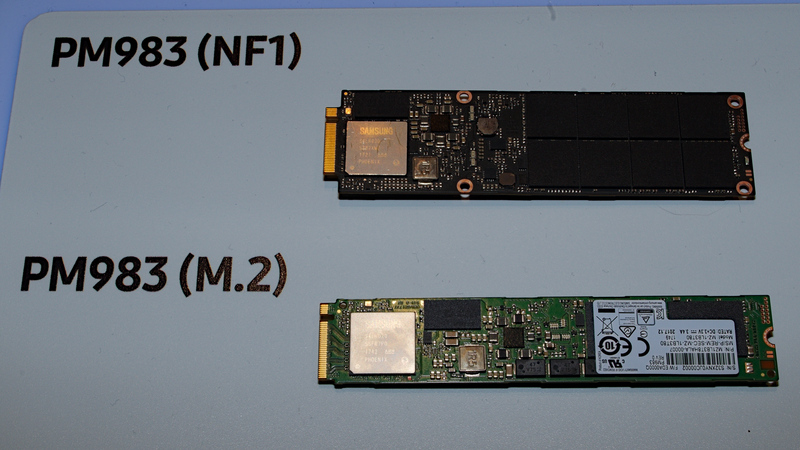 More importantly, real-world mistakes between M.2 and NGSFF are unlikely given the typical use-case for NGSFF SSDs: as hot-swappable drives mounted to trays that do not accept M.2 SSDs. Putting a NGSFF SSD into a M.2 socket will usually require removing the drive from the tray. Putting a M.2 SSD into a NGSFF socket without a tray to guide it would be difficult. Most of the opportunities for a dangerous mismatch come when using adapters from other connectors (eg. PCIe x4 slot) to M.2 or NGSFF, and current adapters avoid most of the risk of damage. The existence of Samsung's NGSFF form factor may serve as a deterrent to adoption of M.2 revision 1.2 features, though it seems that those new features are unlikely to have much market overlap with the strictly datacenter-oriented NGSFF. And if the EDSFF standards win out over NGSFF, then Samsung's form factor may end up being rather short-lived before falling into obscurity. No, Samsung is fully at fault for utlizing the exact same connector yet overriding the existing spec. PCI-SIG is suggesting Samsung should've keyed the card differently. That's what is already done for M.2 devices : pcie x4 nvme is M-keyed and sata is B-keyed. They have different notches on the connector end so that you can't insert incompatible devices into slots not designed for it. PCI-SIG didn't design "M.2 v1.2 to have conflicts with Samsung's design". They are using part of the existing spec, which btw already supports USB 2.0 and expanding via reserved pins (for the new lower voltage supply). One absolutely, positively does not touch anything marked reserved in the spec. Anyone touching that is fully at fault for problems. Why didn't Samsung simply design a different connector since the entire form factor is different anyways, or just key the card differently as PCI-SIG recommends? I am going to assume they did not use a different form factor/socket because they actually wanted their new and improved design to get into the market faster and not be released and then no one uses it because the big boys/girls over at companies like Intel etc etc want their own designs to be the new tech on the block. Was Samsung right or wrong well that is not up to me to decide. I think they made this to get it into the market as easy as possible. Besides that if you look at the pictures form the M.2 to the Samsung design it would have not affected the older M.2 devices at all as Samsung used unused pins in the current design which would have made their devices non functional in current M.2 sockets as well as not causing any problems if you were to plug one of Samsungs new devices into the current M.2 socket except it would not work.